I never thought I'd see the day but I have been bit by the crocheting bug. I've been learning from a variety of sources but the most inspiring has been Hygge Nook who has links to instructions she has used. The design used above was courtesy of 'the yvestown blog'. I'm still decideing whether to add black or white borders. 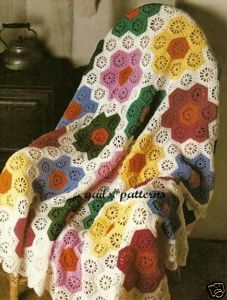 I'm loving the 'eclecticness' and vintage feel of the blankets. I have visions of cuddly quilts in camper vans and hippies toasting marshmallows by bonfires. Wish me luck! You should try youtube too! I'm a very visual learner and I taught myself to knit from youtube! 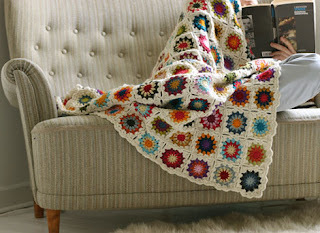 Crochet is my next craft to tackle! Your peices are looking good! Not too sure I can hop on this crochet train with you, MoonDoggie. Sorry to be such a "Negative Nellie", but I'm just not feelin' it. All things CROCHET just conjure up visions of little old ladies in my head (not that I think there's anything wrong with little old ladies, because I don't) and I just can't seem to get past that! But I totally get how it appeals to YOU from a vintage appreciation perspective. And, of course, the whole funky "eclecticness" of it definitely has an appealing kitsch value. I say, if it makes you happy, "Crochet away!" Jessica May - I'm still a bit surprised at myself! Anthony - It's ok, I get it. I've felt the same as you for a very long time. I think the blankets are cool (and the cushion in that first picture) but I've asked a friend to make sure she shoots me before I make any cutesy ornamental type thing - sorry crochet lovers but that just ain't my bag.